The location has been through different owners and one thing that has not changed, is the Spirits remain. The Stag's Head in Willow Springs, IL. The building known as one time being a Capone place right outside of Chicago, is today a fantastic Irish pub and restaurant known as The Stag's Head in Willow Springs, IL. have included my findings as a Spirit Feeler and what I felt in many of the areas in location. Recently the A&E TV show 'Paranormal Cops' showcased the location now The Stag's Head and confirmed also that it is haunted. The feelings that I was able to pick up where so strong back in 2004 near what used to be the old furnace and at times it was what the Capone gang used to do to get individuals to talk, that for the first time and only time, I was drained so bad, I ended up in bed for two days afterwards. individuals not friends of the Capone's gang, would be dragged from inside through the tunnels and into the woods. Also tunnels ran across the street of Archer Avenue to the Willowbrook Ballroom and also in an area of the basement, it is said a body was buried and covered over. basically where tortured. Plus you also have the brothel area that is on the 2nd floor and a area that is haunted. As I said this was a gambling hall and brothel back in the day of Capone. When the book Encyclopedia of Haunted Places came out in 2005, I also had a page of information in the book about the Ashbary Coffee House, about a mile east of the Capone building and in the information about the coffee house, I mentioned the paranormal findings there, basically the spirits of a family that included a little girl. How did a brothel and gambling hall come to have a little boy 'spirit' from the time of Capone's brothel and gambling, running around and never before was mentioned or even felt by others until the book and my information about the coffee house came out and the owner then read it. Many people visiting the location after the story of the little boy spirit started, felt it was just that. from England came out to film Ursula and I, and we went into the room that was being said to be Adam's bedroom. Anger came over me by way of the Spirits of the building, as the Spirits where very angry over this story of a little boy named Adam and I expressed it for the TV crew. The place has paranormal activity as do the woods behind it, as the woods is the very first place I did my Circle of Energy, but that area is a Spiritual area once occupied by Native Americans and why I have always been drawn to the woods behind The Stag's Head. I'm very happy that the location has new owners, The Stag's Head is a great place and I have had tours there already. The one on Valentine's weekend filled up in 48hrs. Individuals can have a paranormal night there with just there family and friends and I will do what I do on paranormal nights and tours. Also I will be holding more paranormal nights for the general public. The next Paranormal Night at The Stag's Head is March 28th, 2010. 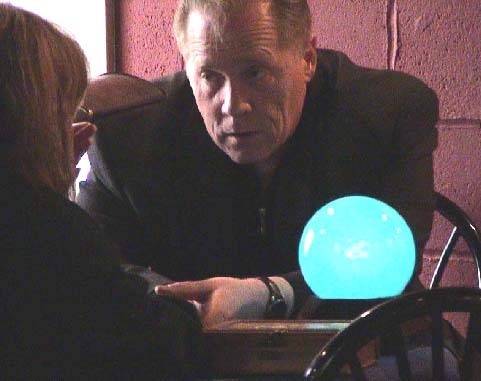 A Chicago Psychic Reader that has been written about in four book, with two published in 2009.